During the February Greater Atlanta Coin Show, many visitors filled the coin show's bourse to view, buy and sell among the dealers' tables and their numismatic displays. Outside, people enjoyed a warm day in the 70s with overcast skies and intermittent light rain. Here's a big THANK YOU to all the visitors and to all the dealers who made the February coin show a busy place to be. We also received several calls wanting directions to the show. We hope you found us and enjoyed the items on display. This month, several different dealers filled in for regular dealers that couldn't attend due to schedule conflicts. Three were new to the bourse, and three had set up at previous shows. Welcome and thank you to these dealers, and we hope you and everyone had a good show. In addition to items on the bourse, visitors to the show could obtain a 2017 Camp Card from the Boy Scouts in the lobby area outside the show's entrance. For a small fee of $5.00, the card provides the buyer with discounts for services at several popular businesses while the fee helps the Boy Scouts fund their summer camp. The Boy Scouts did a good business and sold all the Camp Cards they brought with them. Congratulations to them! The hotel, as usual, hosted several church groups and other events in their meeting areas downstairs. New this month, people visiting near lunch time saw bags and food from several of the restaurants in the surrounding area. Just before this show date, the hotel informed us they would no longer provide food to the bourse. As a result the dealers took advantage of the different food options available nearby. 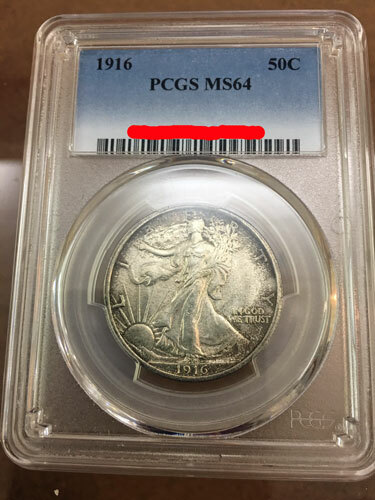 Before we get into the "coins seen on the bourse," let's take a look at an interesting error coin seen recently at the Middle Georgia Coin Club's (MGCC) show in Perry, Georgia. Several of our dealers set up at the MGCC show each year, which is held toward the end of January. At the recent MGCC show, a dealer displayed an interesting error from the 1964 mintage of the John F. Kennedy silver half dollar coins. This was the first year the US Mint struck the Kennedy half dollar, plus it was the last year of the circulating silver half dollar coins. The Philadelphia Mint produced over 273 million of the coins for circulation and over three million of the proof coins. Denver also struck over 156 million of the 1964 Kennedy half dollars. In 1964, the design included the mintmark on the reverse under the eagle's claw holding the olive branch. With this coin's dramatic errors, it's not clear whether Philadelphia or Denver struck the coin. 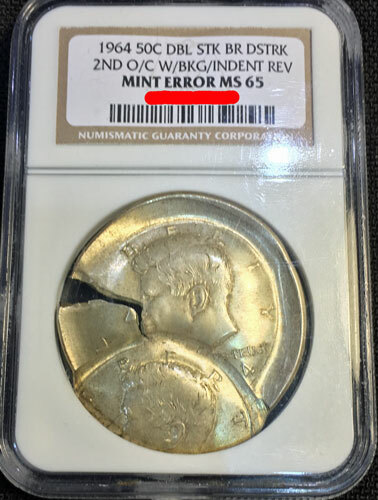 Graded by NGC (Numismatic Guaranty Corporation) as Mint Error MS-65, this coin involved many different mistakes. NGC's designation of DBL STK BR DSTRK 2ND O/C W/BKG/INDENT REV specified several of the problems with the coin. Using the glossary at minterrornews.com as a resource, let's look at the definition of three of those errors: double-strike, off-center and brockage. 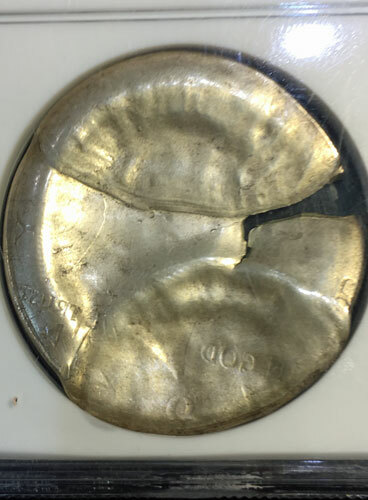 Double or Multiple Strikes: "When a blank planchet is struck by the dies, the normal procedure is for the feeders to eject the struck coin out of the collar and into a chute. If there is a malfunction and the struck coin isn't ejected, it may receive a second or third strike by the dies. A multiple struck coin can happen in many ways and have many combinations of errors." Off-center Struck Coins: "Off-center coins are one of the most common and best known types of errors. This happens when a blank which is supposed to be fed into the press, lands in the collar improperly. When this occurs only part of the blank is between the upper and lower dies. When the dies strike the blank, only that part will be struck with a design." Brockages: "A brockage error can only occur when there are two coins involved. One of the coins involved will always be a struck coin which has not ejected properly. That struck coin will find its way back between the dies and will be struck next to a blank planchet which was fed into the collar. The image of that first struck coin will be impressed into that side of the blank planchet. The result will be a second coin which has images of the first coin impressed into it. Those images will be pressed into the coin and the image will be in reverse. This incuse sunken image is known as a brockage." From the obverse of this coin, it appears two blanks were struck, however the reverse almost looks as if three were involved. Regardless of how it happened or where, this silver coin presents an interesting set of errors. Now, for coins seen at the February coin show, let's take them in both year and denomination order. 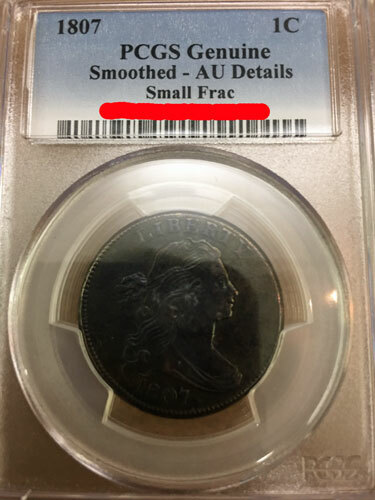 First, let's look at an 1807 large one-cent coin graded by PCGS (Professional Coin Grading Service) as "Genuine Smoothed AU-Details Small Frac." The US Mint produced 829,221 of this coin at the only mint at that time, Philadelphia. Today, numismatists recognize five different varieties for that coin in that year. This one's variety, a "small fraction," referenced the size of the 1/100 found on the reverse. Per the PCGS population report, they estimate only 300 of this particular coin's variety have survived through the 210 years since being struck. As for the grade, we understand "genuine" and "AU-details" (About Uncirculated), but what does "smoothed" mean? "Smoothing is the grinding down of the metal surface of the fields on a coin (usually bronze) to 'smooth' pitted, rough areas. Smoothing can also be performed on areas other than the fields, however, if the work modifies the original form of the reliefs or attempts to recreate worn or corroded details, then it must be described as tooling, not smoothing. Smoothing is a form of tooling but is less destructive. In the 19th century smoothing was perceived as an improvement. Today it is seen as destructive but it is still done by unscrupulous 'conservators' to deceptively 'improve' coins." 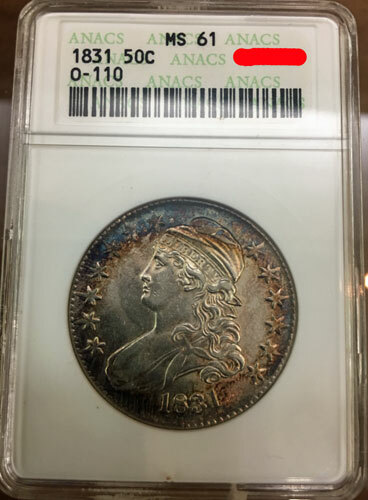 Moving on, the next coin is an 1831 Capped Bust Lettered Edge Half Dollar Coin graded by ANACS (American Numismatic Association Certification Service) as MS-61. The certified label also included "O-110," which is the die variety of this particular coin. The "O" stands for Overton while the "110" represents the tenth die variety for that year. In 1831, the Mint produced over 5.8 million of the Capped Bust silver half dollar coins. For that year, numismatists have identified 20 different die varieties. "The Capped Bust Half Dollars of 1807-1836 are quite popular with both die variety specialists and date collectors. Among early USA coins, they are easily the ones most widely collected by die varieties. Since many of the design elements required to complete a die were punched into it by hand, each die is readily distinguishable, and well catalogued in the standard reference to the series by Al Overton. "The Capped Bust half dollar type is especially popular with collectors, since so many have survived at or near the mint state level. This was due to their relatively large mintages, combined with the fact that they often remained idle in bank vaults as a hard-money backing for paper currency." "Mint luster may be diminished or noticeably impaired and the surface may have clusters of large and small contact marks throughout. Hairlines could be very noticeable. Scuff marks may show as unattractive patches on large areas or major features. Small rim nicks and striking or planchet defects may show, and the quality may be noticeably poor. Eye appeal is somewhat unattractive." Still, at 186 years old, an MS-61 1831 Capped Bust silver half dollar coin is a great example to add to a collection. Two coins from the same year but different mint locations are next on the list. In 1916, the US Mint first produced the Liberty Walking silver half dollar coins designed and described by Adolph A. Weinman as "liberty walking into the dawn of a new day." These two coins, one produced at Philadelphia and one at Denver, were both certified by PCGS as MS-64. The Philadelphia mint struck 608,000, the Denver mint just over one million and the San Francisco mint 508,000. 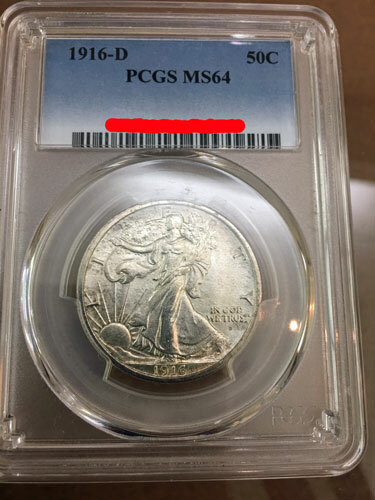 CoinFacts from the PCGS website estimates the survival rate of all grades of the Philadelphia 1916 Liberty Walking half dollar to be 30,000 with 4000 of those in MS-60 or above grade and 500 of that estimate in an MS-65 or better grade. Similarly, they show for the Denver 1916 half dollar, the survival rate for all grades at 50,000 with MS-60 or above at 4000 and MS-65 and above at 400. With the smallest original mintage, CoinFacts estimates the surviving population for the San Francisco 1916 half dollar at 25,000 with 1500 at MS-60 and above and 150 at MS-65 and above grades. "Has at least average luster and strike for the type. Several small contact marks in groups, as well as one or two moderately heavy marks may be present. One or two small patches of hairlines may show. "Noticeable light scuff marks or defects might be seen with the design or in the field. Overall quality is attractive, with a pleasing eye appeal." In other words, these two coins from the first year of the Liberty Walking silver half dollar may not be perfect but they are beautiful examples and a great addition to a collection. 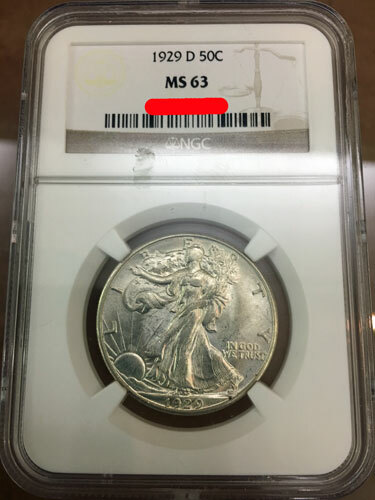 Next is another Liberty Walking half dollar coin from the Denver mint in 1929 and graded by NGC as MS-63. The US Mint produced this year of the coin in Denver and San Francisco. The Denver mint struck just over one million while the San Francisco mint did just under two million. The current estimated survival rate for all grade levels of the Denver minted 1929 Liberty Walking coin is 50,000 with 3000 of those at MS-60 and above and 600 at MS-65 and above. "Mint luster may be slightly impaired. Numerous small contact marks and a few scattered heavy marks may be seen. Small hairlines may be visible without magnification. Several detracting scuff marks or defects may be present throughout the design or in the fields. The general quality is about average, but overall the coin is rather attractive." Again, not perfect, but this 1929-D Liberty Walking silver half dollar coin is still a nice example of a coin that is 88 years old. The last coins for this month's seen-on-the-bourse were in a 25th anniversary set of American Eagle Silver Dollar Coins. The obverse of the silver American Eagle uses Mr. Weinman's Liberty Walking design from the half dollar. For the reverse, the US Mint used John Mercanti's design featuring the heraldic eagle with shield, an olive branch in the right talon and arrows in the left. 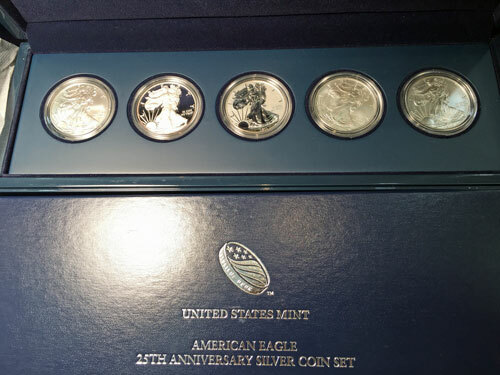 The 25th anniversary set included five 2011 silver American Eagle dollar coins from a variety of mint locations and mint processes. The set included uncirculated and proof coins from West Point, a reverse proof from Philadelphia, an uncirculated coin from San Francisco and a bullion coin with no mint mark from either San Francisco or West Point. On the usmint.gov website, their production numbers show 499,410 of a 25th anniversary "proof" set. However, this is neither a proof set nor an uncirculated set, but the US Mint shows the same production quantity on their proof and uncirculated statistics for the American Eagle 25th Anniversary Silver Coin Set. Now, with those numbers in mind, the Red Book shows a dramatically smaller Reverse Proof 2011-P population at 99,882. Did the US Mint produce almost half a million of these sets, or was their production less than 100,000? On that open-ended question, let's close the tour of the February show. In March, the show will be filled with dealers and their displays of coins, currency, bullion, other numismatic items and other collectibles for buying, selling, trading or just enjoying the items on display. Mark your calendars for the next Greater Atlanta Coin Show on Sunday, March 12, 2017.